And absolutely beautiful watch with multi functional units in the face. Very easy to use very easy to read and absolutely beautiful to look at! I’ve had this watch for about a week and it hasn’t lost even one second of time. I would definitely recommend this to a friend. Add some style to any ensemble with this elegant bracelet watch from the artisans of Akribos XXIV. The subdials feature the day date and GMT. Its classic bracelet and luminous hands and markers result in a clean style that fits casual and modern outfits. 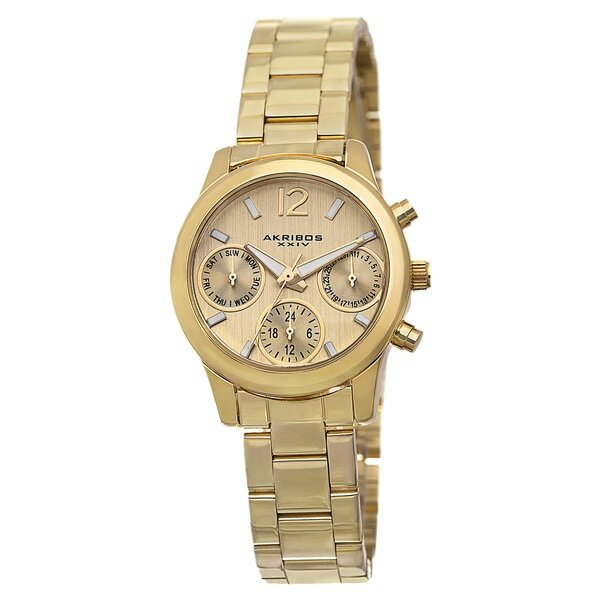 I ordered this watch in the gold tone and silver tone, great price, great fit and looks expensive even though it wasn't. Beautiful watch! The dial is sooo pretty and we love the closure-it is easy to open and close for my Mom,s arthritic hands! I will be a repeat shopper for sure as well as my Mom who is also loving it!! Very nice watch. The only thing that I would say that I was not expecting was that it's a bit larger than I thought it would be. Otherwise it's a very nice watch. The buttons fell off after a few months.